One confession no doubt common to many New Yorkers: I always have between one and seven issues of The New Yorker sitting bedside, waiting patiently for me to find the time to read through them. I never regret doing so, but depending on the height of the stack, they do at times take on the affect of an impatient teacher checking her watch for my tardy arrival. 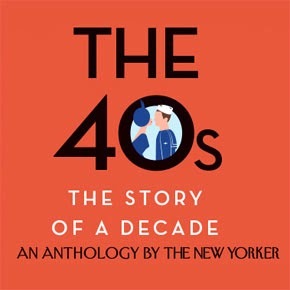 So it was with trepidation that I took up reading The 40s, a newly published, nearly 700-page anthology of pieces from The New Yorker from that decade. Like the magazine, it's a mix of journalism, profile, criticism, poetry, fiction. The 1940s hold great fascination for me, post-war, pre-modern, a time of great transition in the world, and in New York, and this book delves into the historical global context of that pivotal decade. The volume contains gem after gem, leading with a section on the war, which sets the table for the remainder of the book. Some favorite pieces: John Hersey on Lieutenant John F. Kennedy and Hiroshima, Janet Flanner on the Monuments Men, Niccolò Tucci on a visit with Albert Einstein, the poem "Barroom Matins" by Louis Macneice, and stories by EB White, Carson McCullers, and VS Pritchett, among many others. I do wish it contained a sampling of cartoons from that era, assuming they were included back then. I also would have liked to see some stand-alone dance criticism (also providing it was featured at the time), although it does refer to Agnes De Mille's Rodeo in Robert A. Simons' review of Copland and Shostakovich. There is also a hefty sampling of writings on "Feminine Fashions" by Lois Long, which are sprightly reading, but it's an overly generous dedication of space relative to the other cultural genres. Those quibbles aside, it's a fascinating overview of a pivotal time. I consumed the book while its younger, slimmer brethren sat watching, waiting for their turn to be read and perhaps graduate to an anthology of this decade in years to come. I'm sold. It sounds great. Thanks for the review.